John Connoly and James "Whitey" Bulger grew up together on the streets of South Boston. Decades later, in the mid 1970's, they would meet again. 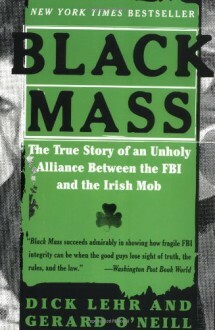 By then, Connolly was a major figure in the FBI's Boston office and Whitey had become godfather of the Irish Mob. What happened next -- a dirty deal to being down the Italian mob in exchange for protection for Bulger -- would spiral out of control, leading to murders, drug dealing, racketeering indictments, and, ultimately, the biggest informant scandal in the history of the FBI.Compellingly told by two Boston Globe reporters who were on the case from the beginning, Black Mass is at once a riveting crime story, a cautionary tale about the abuse of power, and a penetrating look at Boston and its Irish population. Great research. Awesome insight. Saw the movie and wanted so much more! Fascinating to see just how corrupt the law enforcement really was. The rise and fall of the Bulger/Flemmi empire. What can I say....I'm fascinated by Whitey.